On April 3, 2017 March 21, 2018 By felicitousfelixIn Are There Lesbians? After her best friend is shot and killed by a cop, Starr’s world irreparably changes. The Hate U Give is a beautiful novel, and one not for the fainthearted. It deals with complex issues of race and police brutality with an amazing amount of thoughtfulness and tact – it walks the fine line between admitting when actions speak louder than words, without outright condoning violence. In fact THUG’s relationship with the issue of violence is one of extreme candour. The general message I got out of it was that you must speak loud enough for your voice to be heard over the roar, but sometimes actions speak louder than words, and sometimes those actions are the only things that will be heard. It is not the type of book I might usually read, not only because I generally lean towards fantasy, but also because I generally like to have a good time and feel good about the things that I read. And you know what? THUG actually gave me that. granted its about a really heavy issue – racism, police violence, gang lords and class-conciousness – but it isn’t written in a tiresome, issue-heavy way. Really, Angie Thomas has tackled these notions with such grace and aplomb and not only that, but made it all so easily available. For this is definitely a YA book, not spinach-lit that you read because you feel you have to. It is light-hearted when it needs to be, and ultimately its a book about hope, that we can be better people than those around us and those who came before us. What really struck me was how well THUG was written. It shouldn’t have come as a surprise – knowing it had been in a 13-house publishing bidding war – but it still managed to strike me again and again. Mostly when I would start questioning things about what was happening in the book, a few pages later it would respond to exactly that question. The biggest one of these was that around halfway through I noticed that white people seemed to be broken up into “nice” people and irreparable racists. That in and of itself wasn’t my problem, but I wanted to know about the people who, when told that their behavior was racist or even simply a bit uncomfortable, took it upon themselves to change their behaviour. Low and behold as soon as I started thinking this I was presented with a scene of Starr’s white boyfriend Chris, asking her and her friends about “Black” names. 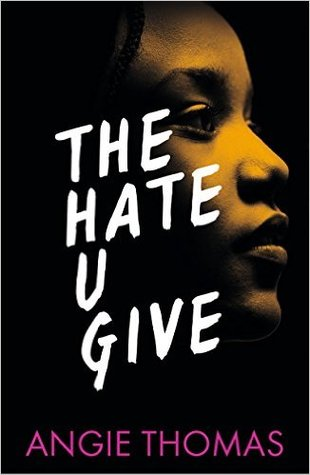 I loved reading The Hate U Give. It is a beautiful book and I feel that it will be an important one. When I finished it, I said to one of my friends that I hope it makes people angry. I hope it makes people scared because it shows them the face of the injustices they have been party to either through action or inaction. I wrote earlier that this is a book about hope, but it is also about actions and consequences, and how the consequences are not equal for all who commit the same actions. The Hate U Give is a subtly forceful reminder of this fact and dear lord, I can do nothing but implore you all to read it.